On Thursday Jurgen Klinsmann named the 23-man World Cup roster, which will be officially submitted to FIFA on June 2. On Thursday, U.S. national team coach Jurgen Klinsmann released the 23-man 2014 FIFA World Cup roster that will travel to Brazil. Longtime player Landon Donovan was left off. Klinsmann will be holding a press conference on Friday at Stanford University in Palo Alto, Calif., which has been home to the U.S. national team's training ground this spring. “It’s an exciting moment when you have narrowed the roster down as a coaching staff, and these 23 players that you’ve chosen can focus now purely on Brazil,” Klinsmann said, according to U.S. Soccer. 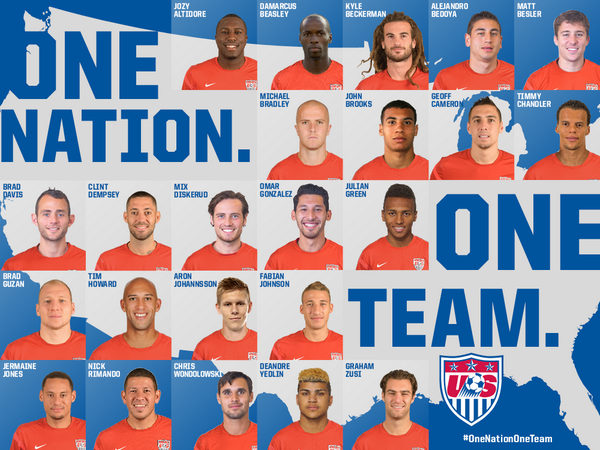 U.S. Soccer released the following image on Thursday evening with the entire roster shown. Most notable roster cut is Landon Donovan, who has participated in three World Cups, has five World Cup goals, and is the all-time leading U.S. goal scorer. It has been an honor and privilege to have represented the US National Team in three World Cups. I was looking forward to playing in Brazil and, as you can imagine, I am very disappointed with today's decision. Regardless, I will be cheering on my friends and teammates this summer, and I remain committed to helping grow soccer in the US in the years to come.